The texture of the hair is attributed to genetics. Hence, if you have fine hair, you can not really do much to improve the thickness of it. However, you should not give up on it just yet! If you are troubled with the thinness of the strands, there are effective styling techniques that you can do to resolve your dilemma. Fine hair is indeed challenging to style. The strands could easily break. It is also difficult to achieve full volume. For women, they find it hard to do intricate hairstyles because the strands break too easily. For men, they often suffer from limp and flat hair which does not look appealing. How can these problems be resolved? If you are troubled by the same concerns too, the first thing that you need is to do regular maintenance techniques. Both men and women should properly care for their mane. This is not plain vanity. Pick a shampoo and conditioner which have natural ingredients. Chemicals can further damage your hair and make it weak. Organic shampoo and conditioner will reduce the breakage and hair fall. There are also the ones which have ingredients that contribute in strengthening the hair. Dropping by the salon for treatment is a good idea too. Having keratin treatment, rejuvenating scalp massage, deep conditioning or hot oil treatment will make the strands much healthier. It is best to consult your stylist which treatment works best depending on the natural texture of your hair. Your mane might not thicken right away but this will improve the texture of your hair. For men, the spiked hairstyle is the best option. Because of the added texture and volume, the thinness of your hair would not be too obvious. Forget about the neat boyish hair cut with razored sides and back. 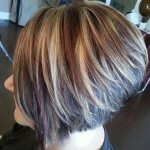 Go for the bolder and more striking chopped cut to add a little more flare to your look. Having thin hair is not so bad. You should not envy the people who have thicker hair strands. You can also look stunning so long as you know the right way to style it. With a few easy steps that you need to do when caring and styling your hair, you will surely look great any day. You can find a lot short haircut, medium hairstyles and long hair styles for thin hair on our site hairstylesweekly.com, if you love our site, why not like us on Facebook and Pin it on Pinterest? Thank you. Under: Popular Hairstyles Chic Graduated Bob Hairstyle for Women – Side View – Pin it!